Our mission is to provide quality, cost effective solutions which ensure a healthy work environment, while maintaining our reputation of being exceptionally responsive to all our clients. Collectively, the Principals of Axiom have over 100 years of experience in the environmental and industrial hygiene consulting field. This experience translates into a more cost effective and technically superior performance. Complete performance bonding and full Comprehensive General Liability insurance, as well as Professional Liability insurance (Errors and Omissions) is in place with no exclusions for asbestos, environmental impairment or pollution. Axiom has been providing environmental consulting services to our clients since 1999. Since our inception, Axiom has on record over 1,500 individual projects where we have provided the services listed above. 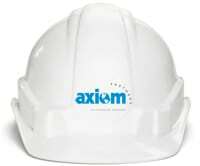 Axiom has a track record of completing projects, both large and small, on schedule and on budget. Axiom maintains a diverse staff of professional individuals who have extensive training in both the classroom and field. Individual qualifications include asbestos inspectors, designers and project monitors; lead paint inspectors and mold inspectors. In addition, Axiom personnel are qualified as trainers, indoor air quality investigators and industrial hygienists and have specific training for confined space entry, fall protection, hazardous waste site operations and construction health and safety. Other specialized training includes staff-wide radiation safety training which is required to handle an x-ray fluorescence analyzer for lead paint testing. Our clients include hospitals, property management companies, federal, state, and local governments, schools and universities, financial institutions, construction companies and manufacturing industries. We are registered as a privately held corporation in the Commonwealth of Massachusetts, with offices in Wakefield and West Barnstable, Massachusetts and Derry, New Hampshire. As a major environmental service provider in the New England region, Axiom enjoys a solid reputation for quality service, timely response and professional follow-through on projects.